Portsmouth, New Hampshire, the country’s third oldest city, has served as a focal point of the New Hampshire seacoast since the 1600s. Portsmouth’s rich historic past, cultural significance, and geographic location has continued to keep Portsmouth among the top places to live in the northeast. 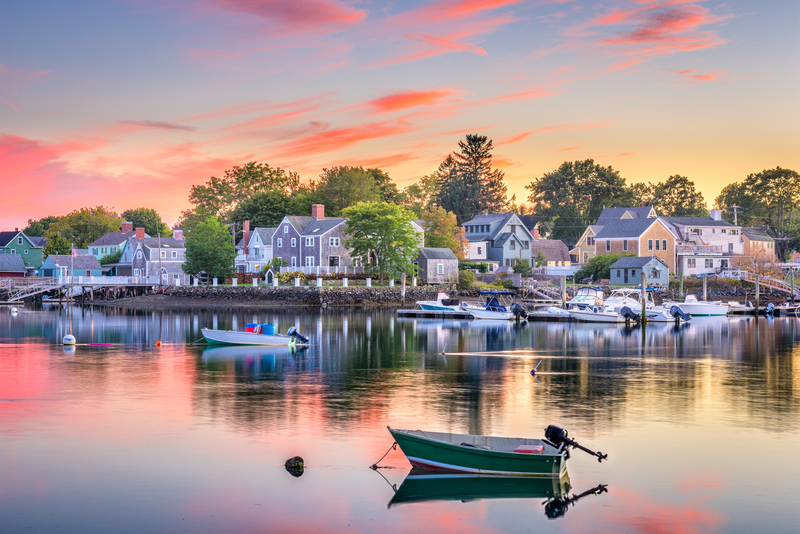 Portsmouth is located just 50 miles north of Boston and just 50 miles south of Portland, Portsmouth is not just a great place to visit, shop, and work -- but it is also an amazing place to call home! Downtown Portsmouth features quaint seaport charm with tree-lined sidewalks, numerous historic buildings, award-winning restaurants and cafes, unique and locally owned shops, art galleries, museums, and more. The Strawbery Banke Museum, located in the heart of historic downtown Portsmouth, is a 10-acre outdoor museum celebrating the 300+ years of American history in Portsmouth. Adults and children alike are invited to explore the 32 historic buildings, 8 heritage gardens, participate in hands-on activities, and watch stories told by costumed role-players. Open throughout the year, there are several special times of year when the magic of Strawbery Banke comes to life even more than usual. You won’t want to miss the American Celebration for the 4th of July or the way the homes come to life during the December holiday season. Prescott Park in Downtown Portsmouth across from Strawbery Banke is a place you will want to visit regardless of the time of year. The Park, situated on the banks of the Piscataqua River, includes extensive flower gardens and flower beds which bloom beautifully every spring. From July through the end of August you especially don’t want to miss the annual Prescott Park Arts Festival. The festival presents a myriad of entertainment from admission-free concerts to musical theater. Now in its 43rd year, the Prescott Park Arts Festival has put on over 10,000 productions over the years, and continues to be a must attend for anyone living on the New Hampshire seacoast during the summer months. The Music Hall, located in a 1878 Victorian-era Historic Theater in downtown Portsmouth, has been named “the beating cultural heart of the New Hampshire’s seacoast” by the Boston Globe. The elegant theater, which has recently been meticulously restored to its original glory, is the oldest theater in New Hampshire, and now also includes a more modern, intimate stage known as the Music Hall Loft. The Music Hall’s productions range from children's theater to book readings, from concerts to movies -- attracting a wide variety of talent from all over the New England seacoast. The Portsmouth School District operates 3 elementary schools, a middle school, and two high schools. The Little Harbour School, located in an estuary in the heart of Portsmouth’s South End, serves 400 students from kindergarten to fifth grade. The New Franklin School also serves students from kindergarten through fifth grade but only enrolls around 40 students. The New Franklin School is highly regarded for its student to teacher ratio, community involvement, and high test scores. The Dondero School, located in a quiet, secluded neighborhood, is a kindergarten through fifth-grade school that serves around 300 students. The Dondero School regularly test higher than the state average on standardized tests. Portsmouth Middle School serves around 540 students from sixth to eighth grade. Portsmouth Middle School has a great faculty of teachers who are genuinely interested in their student’s education and future success. Portsmouth High School enrolls 1,100 students from grades nine through twelve from Portsmouth, New Castle, Greenland, Rye, and Newington. In 2004 Portsmouth High School completed a $36 million renovation. For students who have not been successful in traditional academic settings, the Portsmouth School District provides the option to attend the Robert J Lister Academy. The Robert J Lister Academy is a public high school serving 30 students. Despite being located off of Portsmouth HIgh School’s campus, students still have access to extra curricular and tech opportunities that traditional students have. Lister Academy provides students with a tailored education that takes into account a student’s individual academic, social, behavioral, and therapeutic needs. St Patrick’s Academy in Portsmouth is a preschool through eighth grade, private Catholic school. They are currently building a brand new, state of the art, 28,000 square foot building that will also include an outdoor amphitheater and connections to miles of natural trails. There are several higher education options in Portsmouth. Great Bay Community College, part of the Community College System of New Hampshire, has their main location Portsmouth. Academic offerings include associate programs in nursing, criminal justice, veterinary tech, and more. Certificate programs include bio technology, marketing, programming, and much more. Franklin Pierce University, voted among the top 10 schools in 2009 by Forbes, has a graduate and professional program campus located in Portsmouth. Granite State College, which has 9 locations across the state, operates a campus in Portsmouth that offers Bachelor’s, Master’s, post-baccalaureate teacher programs, transfer opportunities, and online degree programs.